From its inception, Eden has been a beautiful place to call home. For generations, the fertile soils of Eden have yielded outstanding fresh produce, feeding countless individuals locally and in other states. Before the days of easy travel between places, Eden had thriving retail, commercial, and industrial areas. One business still produces that unique musical instrument, the kazoo, and thanks to inventors from Eden, tractors ride more comfortably and train travel is safer. The town produced a handful of poets, a well-known artist, a concert pianist, five state assemblymen, a state senator, and a chief judge of the State Court of Appeals. 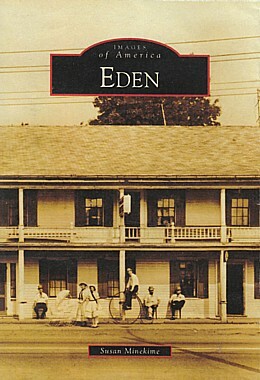 Author Susan Minekime serves as one of Eden's town historians and is the former director of the Eden Library. Many of the vintage photographs from the 19th and 20th centuries have been generously contributed by local residents and chronicle the town's rich history.